We all want Auburn to win and to win at the level they did during 2004, 2010 and 2013. The past two seasons (8-5 and 7-6) has raised concerns and some of them are justified. Check out the following data in recruiting for a moment and consider the level of competition from 2002-2006 and 2012-2016. The following data are the number of times teams in the SEC-West finished in the top-25 of recruiting from 2002-2006 compared to 2012-2016. I also included UGA because AU plays them every year. - Alabama had 3 top-25 classes which consisted of 17.3% (4 & 5-star talent) and 71.6% (3-star and above). - Arkansas had 2 top-25 classes which consisted of 16.3% (4 & 5-star talent) and 73.5% (3-star and above). - UGA had 5 top-25 classes, including 4 top-10 finishes which consisted of 42.4% (4 & 5-star talent) and 89.8% (3-star and above). - LSU had 5 top-20 classes, including 3 top-10 finishes which consisted of 46.3% (4 & 5-star talent) and 89.3% (3-star and above). - Ole Miss had 1 top-15 class which consisted of 33.3% (4 & 5-star talent) and 80.8% (3-star and above). 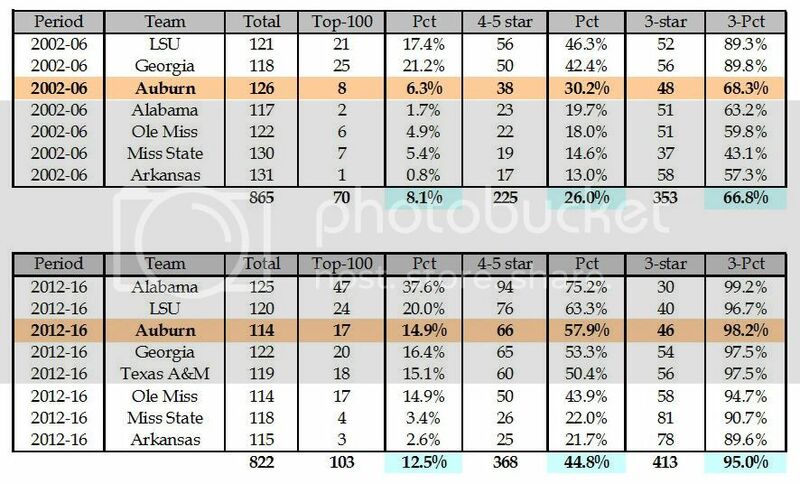 - Miss State had 2 top-20 classes which consisted of 29.1% (4 & 5-star talent) and 52.7% (3-star and above). - Alabama had 5 top-3 classes which consisted of 75.2% (4 & 5-star talent) and 99.2% (3-star and above). - Arkansas had 2 top-25 classes which consisted of 22.9% (4 & 5-star talent) and 95.8% (3-star and above). - UGA had 5 top-15, including 3 top-10 finishes classes which consisted of 53.3% (4 & 5-star talent) and 97.5% (3-star and above). - LSU had 5 top-15 classes, including 4 top-10 finishes which consisted of 63.3% (4 & 5-star talent) and 96.7% (3-star and above). - Ole Miss had 4 top-20 classes, including 2 top-10 finishes which consisted of 50.5% (4 & 5-star talent) and 99.0% (3-star and above). - Miss State had 3 top-25 classes, including 2 top-20 finishes which consisted of 23.4% (4 & 5-star talent) and 92.2% (3-star and above). - Texas A&M had 5 top-25 classes including 3 top-10 finishes which consisted of 50.4%% (4 & 5-star talent) and 97.5% (3-star and above). Please focus initially on the increase of top-25 finishes during 2012-2016. Look at the percentage of 4 & 5-star talent compared to 2002-2006. During 2002-2006, Alabama made the top-25 only three times. LSU and UGA made it every year. Back during 2002-2006, Ole Miss, and MSU combined for only three top-25 recruiting classes. Now we see Ole Miss on the 2012-2016 list four times and MSU 3 times. Alabama is clearly at the top of the list not only in the SEC but the entire nation. Georgia and LSU made the list 5 times each again and improved their recruiting compared to 2002-2006. Texas A&M was added to the West in 2012 and have yet to slip out of the top-25 in recruiting, with three top-10 classes. Ole Miss and MSU are no longer the easy wins they once were during the 1980's and early 90's. In fact, Ole Miss is closing in on Auburn in recruiting under Hugh Freeze becoming one of the six teams in the SEC that will enter 2016 with over (50%) 4-5 star talent on their scholarship roster. Auburn is also one of the top-six but plays the other five in the SEC every year. Summing up... Alabama, LSU, Georgia, Texas A&M and now Ole Miss are in elite-status of recruiting, and Auburn plays them every year. Even if Auburn went 50-50 on a yearly basis, that is at least 2-3 losses every year in most cases. It becomes worse with Clemson on the schedule the next couple of years. If you add in the occasional games with Florida and Tennessee, who appear to be on the rise again, it certainly becomes a very challenging schedule regardless of how talented Auburn might be during a given year. Though Arkansas hasn't made a significant rise in their 4 & 5-star recruiting, they have significantly raised their total number of 3-star and up recruits. Finally, take note of the percentage of 3-star players & up from 2002-2006 compared to 2012-2016. Three-star talent becomes a major issue now when teams like MSU, Arkansas or South Carolina are loaded with experienced rosters. Remember 3-star recruits are players that possess the potential to develop into 4 & 5-star talent after a copule of seasons of development. It certainly has made MSU competitive the last couple of years possessing the most experienced roster in the SEC when it comes to players with 20 or more games of experience. The same can be said about Ole Miss, and now they have a much higher mixture of talent to go along with years they are experienced. Mississippi State under Dan Mullen is much like Auburn under Tommy Tuberville. Tuberville's teams had their best seasons when they had at least 20-players of 20-games of experience, including at least 10 players with 30 games of experience. I post this data not to make excuses for Auburn's 7-6 season in 2015 but to show the reality of just how talented and competitive the SEC has become over the past 15 years, especially in the West. There will still be seasons like 2010 and 2013 mixed in for Auburn when all the cards fall into place for the Tigers. It also means there will be 8-5 seasons as well simply because of the competition. Football runs in cycles, and the EAST is obviously the weakest Division right now but were once the strongest with UGA, UF, and UT battling it out during the 90's into the mid 2000's. I hope Auburn bounces back next year and if they don't, I know it will happen soon, regardless of the HFC. It should make Auburn fans appreciate teams like 2004, 2010 and 2013 when they come along and is the reason I believe Auburn needs to support Malzahn as much and as long as they can. The program requires more than just recruits and victories. The program needs consistency and stability and not just the kind found on paper. Once there are clear signs Malzahn is losing control of his program than a change is warranted. I firmly believe 2015 was a "consistent QB" away from winning 9-10 games. ...and this is why I just roll my eyes whenever someone complains about "easy" OOC opponents. Indeed....and of course, when are the newer players supposed to get game experience? Just check the list published "Inside the Auburn Tigers" of the guys who see action. In most SEC games there is far less substituting. It's the OOC games where most of the eligible guys see some action and get the feel of playing on the big stage. I continue to be amazed to read comments that AU should be playing a couple Oho States or Southern Cals or..... other Power 5 teams between SEC games. The other SEC West teams recognize the reality of their league, thus they all play a Mercer, or one or two of the geographic schools. Thanks for the analysis Stat....good to see where we stand. Things may change in the future, but for now, nobody in the SEC has a cakewalk. I realize we are going to be in a dogfight every time we take the field against an SEC team, but we should never be in a dogfight with Jacksonville Sate. Hopefully that was a fluke but it sure didn't look like it at the time. True....and Jax was better than most of the cupcakes the SEC teams play. Turned out that the game was an indication of what was ahead for AU as much as it showed that Jax was a very good team .....especially in the FCS classification. Thanks for the data Stat. I kind of see what you mean about 2015 being "a consistant QB" away from being a 9-10 win team. But in 2014 we had experience and really good players that made it to the pro's....and we weren't a 9-10 win team that year either. The SEC West has been a gauntlet for nearly a decade and shoulld remain that way for a long time. I just makes me sick to see our on-the-field production on a decline over two years landing us in the cellar of the division with the Mississippi teams above us. We finish 7th in the country in recruiting and 4th in the SEC West. Brutal? Yes. The defensive collapse involved multiple factors. The offense played well enough to beat TAMU, Alabama and Wisconsin. If AU had the 2015 defense, Auburn is likely 11-2 in 2014. As long as we are in the same ballpark as our SEC West counterparts we will be fine as long as key positions such as QB and the OL/DL are up to par. A ton happens between signing day and the eligibility expiring of the kids that signed on Wednesday that there's just no way to say there's a big difference between any of the top 10 or 15 teams' classes. Wasn't our 2000 recruiting class ranked in the 20s? The one that made up the seniors of the 2004 team? Fair enough. But we are paying our coaching staff to be in the hunt until the very end for the SEC West Division championship at the least and have the talent on campus to do so. There is never an excuse for AU to finish last in the West. It is also inexcusable to have the record we have against LSU, uga and spuat since 2008 given our talent and what we are paying our coaching staff. I do understand spuat is now at a different level, but LSU and especially uga are not. At this point, IMO we don't have the coaching staff nor the players to win the west. 2013 may have been the last time we win the west and play for a national championship. That is why I think we should be moved to the east because our chances are better at winning in that div. What coaches do we need, along with players? How do you suppose we get them? How do you suppose we keep them? That is a different issue IMO and I think you're right btw. We have EVERYTHING we need built into the AU program necessary to never finish in last place in the West. In defense of A4E, the east might be a bit easier. This gap though is closing rapidly. I have said over the years that if we get a to 12 class year in and out, we can win our share of big games and contend for the West title. I still say this in that looking at this year's class, we filled some needs in a huge way with what is the top DL class and the top receiver class. I will take this class over any other in the SEC. 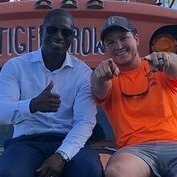 One thing that I love about Gus is that he recruits more specifically for needs and not loading up on 4&5 star recruits that do not meet our needs, but do look impressive on paper. I think starting in 2016, we will see much needed stability and will start on the path with winning 9 or more games consistently. Yes, there will be titles to be one, but not every year. I think some of the teams in the west are going to start falling back in the pack with us moving up to the team that will challenge bammer and LSU for west titles consistently. This is the claim in AUIH1's post with which I agree, also. We should never finish last in the West, even if we have to play UGA from the East every season. And I also agree we need to improve our records against our biggest rivals. We should have beaten UGA this past season, period. We need to beat them next year, period. We also need at least to be competitive with LSU (failed this season) and Ole Miss (I think we were competitive in that game this year). The Miss State game was a disappointment. AUIH1 makes a point that I've been driving home since the end of the season. There are NO excuses for Auburn finishing last in our division. There are NO excuses for programs like Arkansas, MSU and now OleMiss to pass up Auburn. Aside from hiring Coach Hand, I see very little improvement in the coaching staff compared to last year that leads me to believe AU will all of a sudden jump up and challenge for the West this year. We have a brutal schedule that's front loaded with some hurdles in Clemson/aTm/LSU coming to JHS and back loaded with 6 (SIX) away SEC games. My GOD that's a gut wrencher of a schedule. Over any period of time (whether it be, 4, 5, or 10 years) we should, at worst, be splitting with Bama, LSU, and UGA. We have not been doing that. To make matters worse, the Mississippi schools and Arky have been giving us trouble lately. We've split with TAMU, however. We've upset them twice while they upset us once and shellacked us another. It's weird how we are this major program with having a national championship to our name and almost having TWO national titles in a span of a couple seasons but still do so poorly against our main competition. Lol how can we be so good but so underwhelming at the same time? Aside from hiring Coach Hand, I see very little improvement in the coaching staff compared to last year that leads me to believe AU will all of a sudden jump up and challenge for the West this year. We have a brutal schedule that's front loaded with some hurdles that we need to clear right off the bat if AU wants to make some noise in the run for Atlanta this season. Ugh, you're right. I don't have any expectations for Atlanta next season I would just like to see us hit 8 wins in the regular season considering our huge question mark at QB and at the most critical parts of the OL. can we name any team that should always or consistently finish in last place? Becoming a pretty tough neighborhood. That place is reserved for Arky and one of the Mississippi schools. I know I'll be looked at as a "get off my lawn" type of guy with this older mentality (even though I'm relatively young) but no way AU, LSU, Bama, or TAMU with their locations and resources available to them should finish lower than Arky or the Mississippi schools imo. Times are changing I guess as the recruiting numbers indicate. Arkansas? They have a walking baffoon for a coach, they've never recruited inside the top 25. MSU? Mullen's a decent coach compared to his predecessors, but can't bring in talent like Auburn. They have nowhere close to AU facilities or resources. OleMiss? Historically a pitiful program now has somehow, someway jumped up out of nowhere and hauls in a top 5 class and until the 4-25 Arky game was headed to ATL in '15. AU has better facilities, fan support and resources. There's no excuse for AUBURN to fall below those programs. If the damn neighborhood became tough then why then can't AU man up and hold their spot in the upper half of the division and challenge these teams to the point that we keep them down where they belong? A tough guy will take over the neighborhood, but only if you let him. At least 4th in the west this year and I'll be satisfied. 2017, we need to be at LEAST third. Watson, Fournette and Chubb will all (probably) be gone, we should have an experienced QB, a decently experienced OL, plenty of talent on the DL, a veteran defensive backfield, and likely an elite senior kicker. This is why I would not complain about Auburn relocating to the East division.